I am really enjoying your book! Great resource. As an older player, it is nice to see an explanation, with exercises included, that addresses the needs of how to play with better sound and range. I am very appreciative of this book! The best help I ever received. I have played professionally from 1977 - 2002, I then stopped, disillusioned and fed up. I was talked into starting again in January this year (2013). I have been using Patrick's book now for a little over a couple of months and my chops have really settled down and the reliability is consistent. I recently was asked to fill the lead chair of a good big band. I have Played two, two hour gigs including soloing and I can report that my chops seem almost as fresh at the end of the gig as they did at the start. In the words of a famous paint advert.... "It does exactly what it says on the lid." If you are serious about developing your chops, air and sizzle, this book is an absolute must. Simple! Thank you for sharing your wealth of knowledge Patrick. Best Book on Building the Trumpets Range. Over the past 43 years, I have owned many trumpet method books including books specializing on building the trumpet range and endurance. Patrick's book is one of the best if not the best trumpet method books I have encountered that targets building range and endurance. Not only is Patrick a really nice individual, he is a very unique trumpet player as evidenced by his many years as Maynard Ferguson's Lead player. My biggest regret is losing my spiral bound issue of this great book. 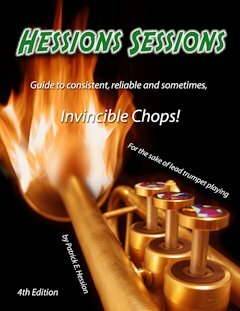 I highly recommend this trumpet method book if one is interested in expanding their range and endurance. Patrick's playing ability can be easily assessed via YouTube. Russell D. Dixon "Russell D"
Putting in some work... Thank you Patrick for a great book! So far so good. Bought this for a friend, I am told, and I quote "It has really improved my range, there's some sweet lessons in this thing." So far i've heard no flack about it, and to be honest my buddy's been playing very well. I'd recommend this. Hession, Patrick E. - Harrison Township, MI: Author 2004. Most noted for his extensive work as lead trumpet for Maynard Ferguson, Patrick Hession developed his formidable abilities through years of playing in the UNLV Jazz Ensemble, Las Vegas show bands, cruise ship bands, and the bands of Lionel Hampton and Glenn Miller. This book contains lessons and exercises that he has developed in a continual pursuit of self-improvement. Before delving into exercises, Hession writes about his approach to music and identifies some key issues with regard to playing in the upper register on the trumpet. The tone of Hession's writing is very informal, almost conversational. His approach is mindful of both the physical and mental components necessary for success. More specifically, he discusses trumpet players as both artists and athletes, with the idea that each day should bring the player closer to his or her goals. Hession also emphasizes the importance of maintaining focus while practicing and performing. He refers to being "in the zone" and playing with 100 percent concentration for each note. The importance of air is also discussed at length, with an emphasis on efficient breathing and a supported air flow. Hession developed the 25 original exercises contained in this book through his practice and preparation in the professional world. The first exercises address breathing, pedal tones, and relaxation. From there, further exercises use chromatics and lip slurs to emphasize the importance of using air properly to produce sound. Centering pitch and tone are also covered. As the book progresses, Hession frequently revisits exercises that are intended to refocus and relax the player. Some of the later exercises address controlling the air stream, glissandos, and lip trills. Overall, Hession's book presents a very broad and developed mental approach to the upper register. 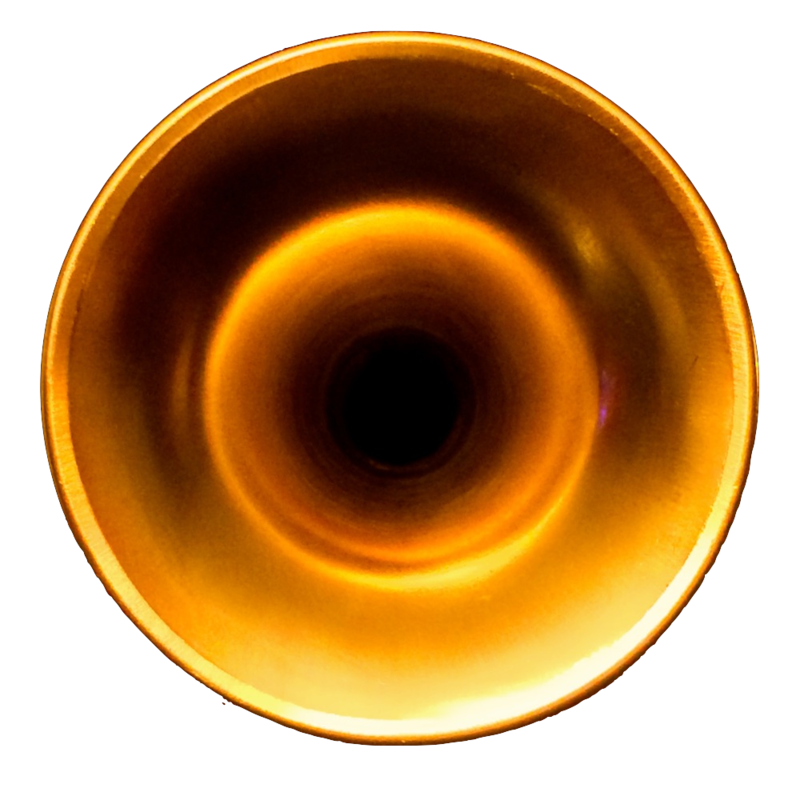 It does not espouse a "one size fits all" mentality, but rather encourages persistence, focus, and an emphasis on the basics of trumpet playing. If there are two points that Hession is insistent upon, they are that both airflow and focus are crucial to success on the trumpet. This book does not claim to make you a lead trumpet player overnight, but it does give you some great insight into the mind and methods of a great lead trumpet player. When played according to Hession's instructions, I found these exercises to be very beneficial. Have been revisiting Patrick Hession's excellent "Hession's Sessions" book the past few days. My chops feel great! When I first got it, probably 5 or 6 years ago, it was too much of a workout, and my impatience got the better of me. Now I find it to be a well structured and well balanced warm-up, which is setting me up nicely! If you don't have it already (or even if you do!) it's well worth investigating. Your book has kept me in shape when school is off, when work is slow, and when I really need to strengthen my chops for shows or lead gigs. I have had it for about 2 years and slowly progressed my way through it. I would love to have a lesson and work out of it, to help alleviate my bad habits (pressure for one), and to learn how YOU do the exercises. I also recently picked up the BL4 S6 "XLT" Monette piece. It is awesome, the best I have ever played. I like it more than my B4L, and way more than my Bob Reeves. It is perfect for me; shallow bowl shape, huge throat, and big backbore, but not too big. Kudos on everything man. You're one of the greats in my book. Thanks for your excellent method book - it's been very helpful. I just want you to know how much I appreciate all of your help. You took me with only 2 months of trumpet experience this year and now after 7 months of lessons from you (not to mention your 24/7 trumpet help phone line) I have received a scholarship to the Interlochen Center for the Arts High School. You taught me a foundation that I can build on for the rest of my life. I bought your method book some time ago and am really enjoying it. It's all good stuff mate. I was on the Monette site just now and saw the OCTAV-EYE-ZER! clip. Very funny, would be even better at a gig, with a dead straight face of course. Cool thanks mate, and maybe one day when I'm over there (or you here) we'll run into each other. Do you plan any concerts in Europe (e.g. Switzerland)? I've been reading your book and the first exercises have helped me a lot. The relaxers are a big help. I hope to see you some day. Fabulous show in Ames, IA tonight. Thanks so much for the tips on using your technique book and on playing in general, breathing, etc. You happily spent time helping fellow trumpet players and I really appreciate it! Your Hessions Sessions is the best method I ever used. I do it just as you state and I feel great. Dec 5 is 1 year that I have the book. Where are you playing and is the Maynard band going to perform ? professionalism very much - keep on holding the torch high! Your book is right on. Each lesson is very clear. From DEC., 5 to now I made a lot of progress. I received your book MONDAY and played the exercises Monday, Tuesday and Wednesday and I feel terrific! The best book I ever used. Your book really helps me play more consistently. I am really glad to hear of your recent achievements. Your book has greatly helped me with my upper register while playing with the Marine Band. I am transferring from San Diego to Parris Island, South Carolina on May 1, 2005. Please let me know when you will be performing in the Carolina area. I would love to catch one of your shows again. Take care and good luck. You have inspired me with your book and your bio. I am a freshman in high school and I use the B4L, it's amazing!!! It helps me out not only pitch wise but also playing long jobs. I play lead for my high school and I use your book. I can play an easy "Dubba A." Thank you for the book, Patrick, YOU'RE AMAZING!!!!!!!!!!!! Hi Patrick your BOOK IS Great cant wait for the NEXT keep up the good work with MAYNARD.. I wanted to follow up with you on your Trumpet book. I'm the guy who bought your book for a double scotch and a few bucks at the Stratospheric event in Los Angeles at the LAX Four Points Sheraton. The book is really great. Kind of a one-stop, systematic distillation of a lot of playing concepts. I have managed to work my way through about half of the exercises and look forward to attacking the rest. One of the things I found very helpful was your suggestion to sub-divide the beat while counting and breathing. By breaking the beat into sixteenths my mind could no longer wander to thoughts of insecurity, etc. It is a wonderful way to gain the focus your book preaches. There is a book out called The Inner Game Of Music that provides some exercises for focusing, but I found your approach much more helpful. Thanks and I hope to catch one of your shows soon. Great site! I saw you down at Croce's two weeks ago and I was so blown away! Your books is great too! a lot of your tips have helped my playing ability! Keep on playing! Nice new horn by the way! David makes some great horns... and mouthpieces too! The book looks great. Nice to have the emphasis on fundamental trumpet concepts. Relaxed breathing, subdividing, air speed. Good stuff! Okay....by no means am I a pro player....but I thought I would like to add my thoughts to this book since I just read it. Pat's book has a lot to offer. Being a person who has gone through college and I myself always striving to be better, I always am looking for new Ideas...or changes on old ideas. Pat's book goes into great detail about the mental side of trumpet playing. Which I love. He talks about dedication from the very first note to the last. Without going into too much detail about the book, it is a very interesting read. The Warm-up/routine exercises are pretty simple if you know your stuff. A lot of focusing on the air movement. It involves a lot of pedal tone playing as well as moving the air and supporting into the upper register. I also would like to say that the exercises are put together well, and for the most part the directions are written right with the exercise it self....telling you what to do when you breath, and what to strive for. All in all....it's a great book. I'm enjoying your "Hessions Sessions" book I just bought - nice format! PATRICK, I HAVE TO SAY I'M HOOKED! I'VE SEEN YOU AND THE BOSS 5 TIMES THIS YEAR AND AND THE BOSS COUNTLESS TIMES THE LAST TWENTY SOME YEARS ALREADY AND LOOKING FORWARD TO SEEING THE BAND AT LAX SHERATON AND VA. AND AT BLUES ALLEY IN WASH DC. FOR TWO MORE SHOWS. ANY WAY YOUR BOOK HAS HELPED ME IN RANGE, I'VE BEEN ABLE TO HIT DOUBLE G'S FOR THE PAST TWENTY YEARS, BUT I CAN DOUBLE C FOR THE FIRST TIME AND CAN DO IT REGULARLY, THANKS. I DIDN'T KNOW WHAT WAS HOLDING ME BACK UNTIL READING AND UNDERSTANDING WHAT THE PROBLEM WAS. THANKS AGAIN FOR YOUR TIME AND LEADERSHIP ON HOW TO BECOME A BETTER PLAYER. HARD WORK DOES PAY OFF!!!! I 'm glad to see that you are getting such rave reviews. I too received your book a few months ago. It has proved to be a valuable addition to my practice routine. I've had the privilege to study with Roger Ingram a few times and am a regular student of Vaughn Nark. Your approach fits nicely with their basic principles and adds a few touches that I find helpful. As a professional martial arts instructor I can relate to your emphasis on the mental aspect of playing and the importance of giving just the right amount of intensity to the task at hand. Efficiency of movement and clarity of intention is what I teach to my students also. I've come back to trumpet after several years of putting it down. I'm finding playing to not only be a release for me, but also a different way of integrating the philosophical and physiological concepts that I practice and teach. I met you briefly in Philly in July at Zanzibar Blue. I've heard you play about 4 times now and every time you get better! Not only were you smoking' on the bandstand, you were certainly kind enough to chat with me for a few moments. I only hope that I can catch up with you in the future and get some personal insight into how I can better utilize your approach into my daily routine. No one 'method' book is going to be a silver bullet in terms of making anyone a vastly improved player. Being exposed to a range of ideas and approaches generally helps you form your own personalized approach, and I think Patrick's book has a lot to offer in this manner. It is very well written, and is based on sound, fundamental principles. You also get a sense of his enthusiasm for trumpet; he talks a lot about focusing your mind while practicing, and constantly striving to improve; valuable perspective for any aspiring player. I'm inclined to listen to anyone that has spent as much time as he has playing alongside the boss, and apparently has the same basic approach to the instrument. Every night he walks on stage he entering "the lab" in terms of applying the rules and principles, and has a chance to continually modify the approach based on his results. A very good read. I ordered Patrick's book through the mail, and it came to me in a very timely fashion (unlike Tommy Martin, but I don't want to get started on that again) ... anyway I think the book is great, and offers a few new twists on a topic that has been written about much ... chops! I rotate "chop" stuff I got from Bob McCoy, Joe Mosello, Schlossberg, Flow Studies, and Patrick's book as part of my daily routines .. I find giving the chops different things to work on keeps them in the best shape. It's also laid out very well, and everything is explained well .. and obviously .. it works for Patrick! I'd say go for it ... I think it's worth the money. Great website...Great book, I bought it...Looking forward to seeing you in Pittsburgh in Nov. My all time favorite Trumpet players, Maynard, Stan Mark, yourself & The Pgh. Symphony Trumpet section. I met you in Pgh. last year, besides being a great trumpet player, you are also a great person. Hi. After a week of using your book I have seen amazing progress. I always wonder why my high register lack volume and support. My practice time is more focus and rewarding. I thank you for an excellent book. Hession's Sessions Guide to consistent, reliable and sometimes, Invincible Chops! For the sake of lead trumpet playing. I don't typically review books on this site, particularly trumpet "method" books, and this is no exception. I haven't played trumpet since college, I'm no expert. However, I did recently get a chance to read Maynard Ferguson lead player Patrick Hession's new trumpet book, and it interested me enough to write a little segment on it. Upon reading this book, you are left with one resounding impression about Patrick: he is deadly serious and extraordinarily committed to being the best trumpet player he can be. This book focuses on attitude and mental approach to playing the trumpet (or any brass instrument, really) more than any other method book I've seen. Rather than discuss minute technical specifics ("eee" vs "aah", for instance), Patrick focuses on concepts that he recommends players visualize and internalize. Granted, there are dozens and dozens of specific exercises in the book designed to improve your range, stamina and control, but what interested me more (since I no longer play) were Patrick's philosophies. Both Patrick's writings and the "testimonials" in the book feel much more honest than most writing you would tend to find in a trumpet book. Nearly all of the testimonials mention Patrick's ability to shut obstacles out of his mind (such as criticism, fatigue, etc...) and focus purely on the task at hand. Many mentioned that Patrick does not have a lead trumpeter's stereotypical ego, but is genuinely interested in learning from every musical experience. Patrick's chapter on breathing was particularly interesting, as he uses Maynard as an example of "breathing perfection" when it comes to trumpet playing. We've all suspected as much, but it's fascinating to hear these thoughts expressed by someone who stands 15 feet behind him on every gig. If you're interested in reading the book (and trying out the exercises), the book is now available to order on Patrick's website (click the image below to visit). It's Andrew from Plaistow NH. I would like to say thanks for the new book you have out. I bought one a few months ago and after spending time reading, I have learned a lot from it. I like how you talk about breathing exercises and different studies for warming up. It has helped my lead playing a lot and I can hit notes that are insane and they are easy to play. Once again, thank you for your book and please stay in touch. See you later! I took your book and my horn on a week's holiday on a remote island off Greece last week - I spent 4 hours a day with the book -I couldn't put it down. I've found myself doing the breathing exercises wherever I am! - it has already made a big difference to my playing, I play with much more control and confidence already - so I'm sure after 12 months hard work it will be an amazing improvement. Already the guys in a 10 piece Latin band I'm in have said - wow, you're hot tonight - which for a guy that has never played above a high G, or struggled with my breathing was a fantastic boost - thank you Patrick. I will be coming up from Wales to London on Friday 28th May to see you with MF at Ronnie Scotts Club - are you in a position to maybe give me a half hour or 15 minute lesson / chat? - it would mean so much to make sure I'm understanding the book correctly, I feel very secluded tucked away in Wales. Whatever the cost is not a problem, but I understand how busy you are, and how tiring your week there would be - I could come up the day before if it helps. Many thanks for this guiding light - I just hope I can do your book justice and achieve the notes as well as the exercise someday. I've got your book thank you - I'm on my 3rd read before I start work with it - I'm off for a well earned week in a Greek villa next week, I'm taking an old horn, and that's where I'll start work with it. I'm a little scared, as I've never played a double C, but I really believe in your writing, and even if I never do, I'll be a far better player using this book! I hope that you will be with MF at Ronnie Scotts London this May, I will be up with my trumpet friends from Wales on Friday 28th May. Are you available for a lesson on the Thursday / Friday / Saturday? - I would love to have one if so. I have purchased his method book and in reading the "General Approach", a light went on for me. I too March in a Drum and Bugle corps (Kilties) and have been told about about the importance of air for the upper register as opposed to pressure by various instructors in various terms. Maybe it's just the culmination of the all terminology used by all of those people and then how Patrick Hession phrases it that it just pushed it deeper into my brain where I could understand what everyone else meant. In any event I've incorporated his thoughts in the prefaces of each of his exercises, where he explains what the goal of the exercise is and how to do it properly to get results, into my regular routine (lip slurs in Arban's or Clarke's technical studies exercises and etudes for example) as well as the exercises he's provided. The bottom line is this book is working for me and I look forward to the day that my chops too will be "invincible." I just received Patrick Hession's book on Wed. I had a few hours to kill before a concert so I thought I would start reading his book. First of all I think it contains some excellent information about trumpet playing. Second, his emphasis on concentration helped me realize that I wasn't concentrating like I should be. As a result, my performance on Wednesday night was much better than I had expected. I'm really glad to add this book to my practice routine. I, also, recently received Patrick's new method book and, after a quick read-through, I think it is going to work very well FOR ME. Not knowing all of the methods Patrick, himself, went through (and I'm sure there were many!) it appears to me that besides the breathing , relaxing, range, sound aspect the book also seems to have strong influences from John Glasel's method, "Relaxation Techniques"...and from another extremely well-known method of one of MY biggest influences/teachers...Carmine Caruso. Since I've been "into" both of these methods for the past 30 some years, or so, I can't see how this book could do anything BUT help me given that there are MANY more insights from Patrick's own experience/career assembled all in one book in a logical, easy to understand method. Thank you, Patrick!! !